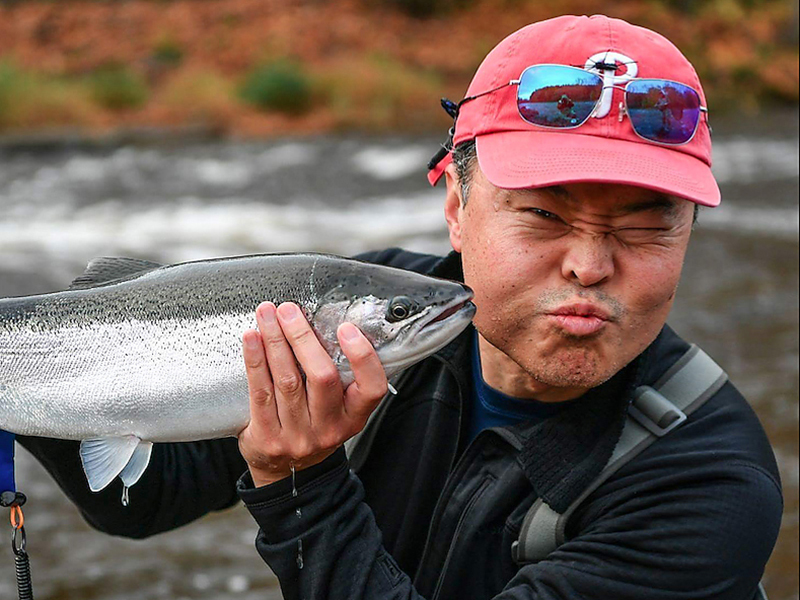 We were in town to fish for steelhead and we were meeting our guide, Greg Liu, at the shop before gearing up and heading for the Douglaston Salmon Run. Usually, it was cold at this time of the month in Pulaski--the Fall colors are fading and the grey of winter beginning to paint the landscape along the river. But Jin loves it when it’s cold. Jin is downright orgasmic when there’s a sudden blizzard on the river, with fly line frozen in the rod guides and visibility is well below zero. However for this trip the weather folks were predicting sporadic rain with unusually warm weather. Jin was not happy. Water level on the Salmon River was low with the flow running a bit above 500 cfs. This was the tail end of salmon season and the beginning of steelhead fishing. 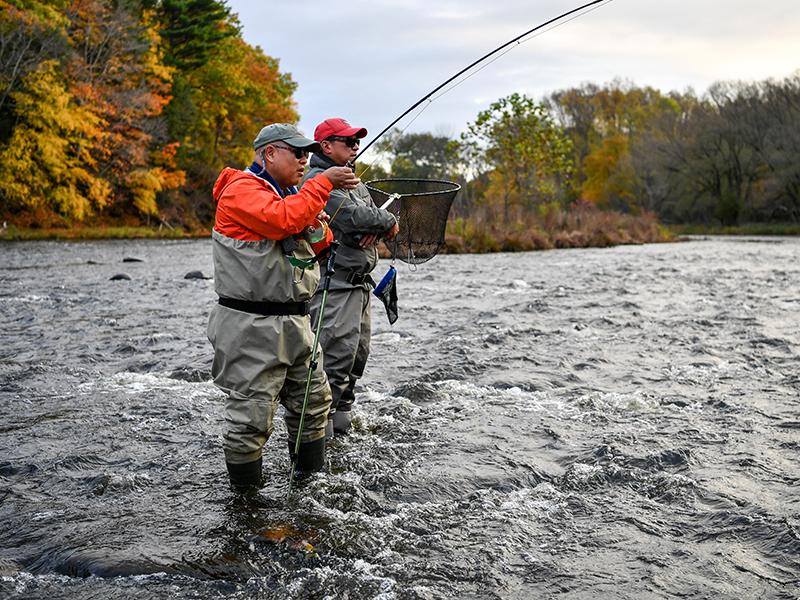 We try to time it when the large push of steelies swim up from The Lake, chasing the salmon to feast on their eggs and deposit some of their own before settling in upriver for the winter. If you hit it right, fishing is awesome. But the trick is to time it right and it is not an easy thing to do. Take your best guess and go fishing. That’s about the best you can hope for. 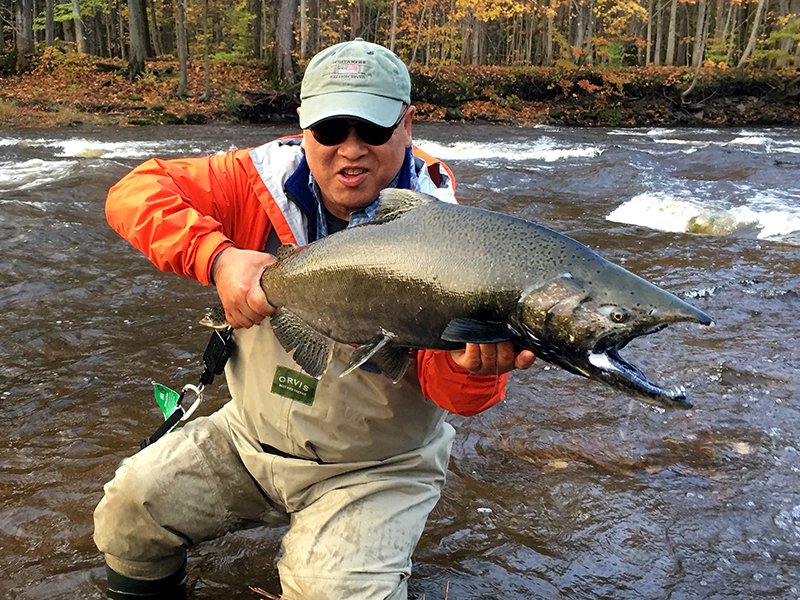 By the time you hear about great steelhead fishing, you’ve probably missed it. Because of the low water and other factors, Greg made us fish the fast water, looking for those deep pockets where fish might hold up to rest during their run upriver. It wasn’t easy. 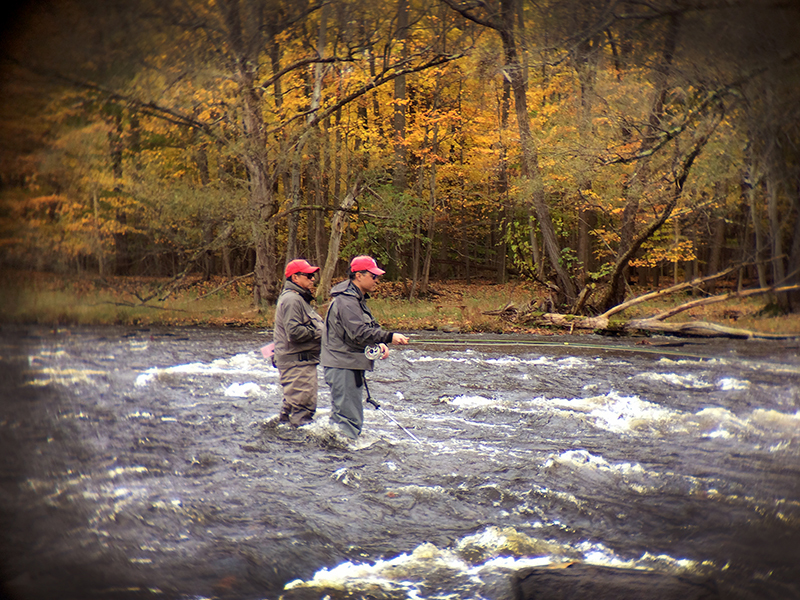 You had to be precise with your cast and watch your line because in fast water things moved...fast. If there was a sudden hesitation in the line, a bit of unnatural movement, set the hook hard. You probably set it on a rock or submerged stick, but sometimes it turns out to be a fish. I lost count on the number of times I got stuck on something solid and lost the fly, the fly and leader, or everything right up to the main line. But every once in awhile, things turned fishy and the fight was on. 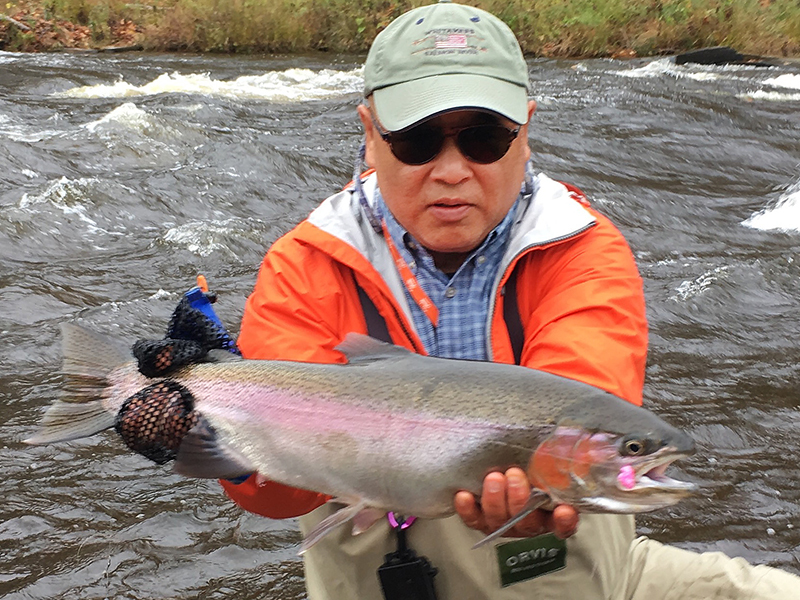 Jin and I hooked into a couple of steelhead and lost a few more. This wasn’t the big push of fish everyone was looking for, but I was pretty satisfied. The weather was really turning warm and we had to stop and strip off layers to cool off before returning to fish. We continued to hammer the seams and slots in the fast water and hooked, but did not land, a few more fish. I bumped into another angler at the hotel that night and he was pretty depressed. He and his five friends had been fishing for salmon for the past couple days and nobody had even hooked a fish. I told him to try further up the river since the main push of salmon had probably left the Douglaston and were up by The Unemployment Line or Lower Fly Zone by now. Of course, the next day, on the Douglaston, I hooked and landed a nice King Salmon and saw numerous others swim past me as they made their way upstream. I hope those guys got a bite upriver. Jin and I stuck to the same fishing plan throughout the day. It was slow, it was slow for everyone, but you had to stay alert because the bite could come at any time. We used a variety of tactics depending on the situation and area we fished. 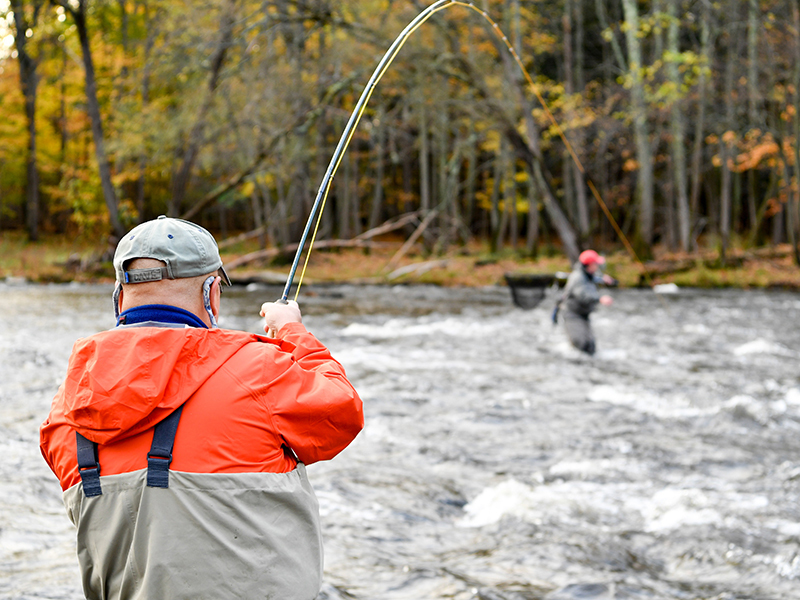 Bottom-bouncing, indicator fishing, swinging flies. Egg patterns, woolly buggers, and streamers of varying sizes and colors. Long leaders, short leaders, heavy or light leaders. All depends on the water. But, in the end, it all came down to paying attention to you line. After the 200th cast, it was easy to let the mind wander but it also made it that much easier that you would miss that sudden stop in the drift, the tick of the indicator, or massive tug that, because you didn’t set the hook, just shook you out of your daydream with an adrenaline rush. All you can do is stand there and watch as the fish gives you the middle fin while it pushes on upstream. DIRECTIONS: Fly into Syracuse Hancock International Airport or, from Virginia, just follow I-81 for a seven hour drive north to Pulaski, N.Y., which is about 30 minutes outside of Syracuse.